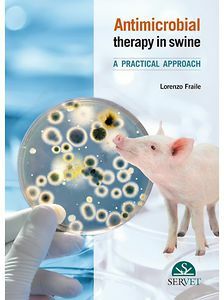 In this book on practical antibiotherapy in swine medicine, the author has tried to present, in a visual and practical way and with an updated view, the most important aspects a veterinary clinician should take into account to design appropriate antimicrobial treatments in swine herds. Thus, in this work, the current pharmacological knowledge is reviewed with the help of real clinical cases solved by the author. Finally, it includes a comprehensive review of what a prudent use of these essential tools to ensure our animals’ health means.